Happy Christmas/Chocolat! | "Il faut goûter"
Chocolate bark is popular this year according to my blog perusing as of late. I lived in France for one Christmas season, and this combination of chocolate accompaniments, discovered at a festive chocolate exposition, won my heart: Pistachio, Almond, and Candied Orange Peel. So this was one of my Christmas treats this year! I melted dark chocolate (70% cacao) in a double boiler, spread it thinly in a pan lined with wax paper, then topped it with those delicious things (I used salted nuts, by the way)–I let it harden in the fridge, then cut it into squares. I also made a batch with milk chocolate. Such scrumptious and perfectly balanced bites of indulgent goodness! A little parcel of distinctive chocolate, my Cinnamon Marshmallows, and these excellently flavorful chewy molasses ginger cookies found on a blog called SavorySaltySweet made its way to some special friends! Happy Happy Holidays, go make some love–edible or otherwise! 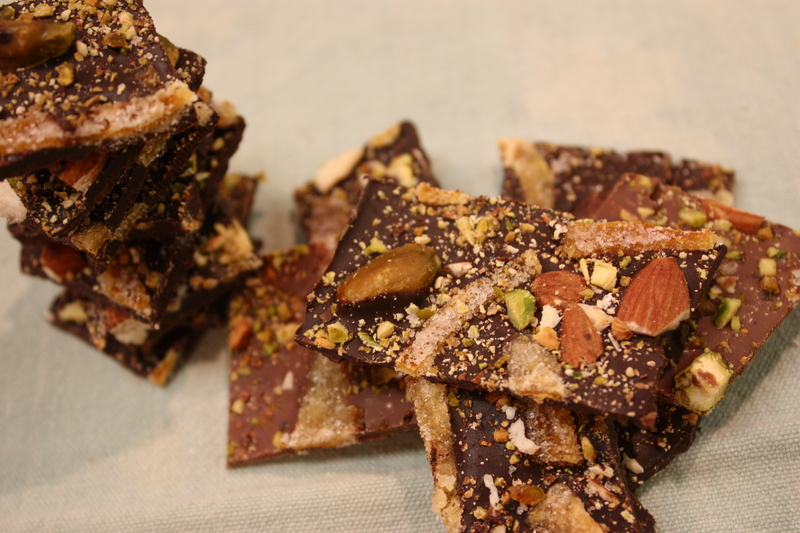 This entry was posted in Sweet, Uncategorized and tagged Almond, candied orange peel, Chocolate Bark with Pistachio, Christmas, Cooking, edible gift, food, Holiday, recipe by needtotaste. Bookmark the permalink. Oh you really put that orange peel to good use. Have a great Christmas! That looks like pretty much the best selection of Christmas treats possible, with the bark being the nicest combination of ingredients I’ve seen yet. I guess I may have to come out of my treat-making slump one of these days for the sake of such gorgeous goodness! Thanks, and a very Happy Christmas to you! 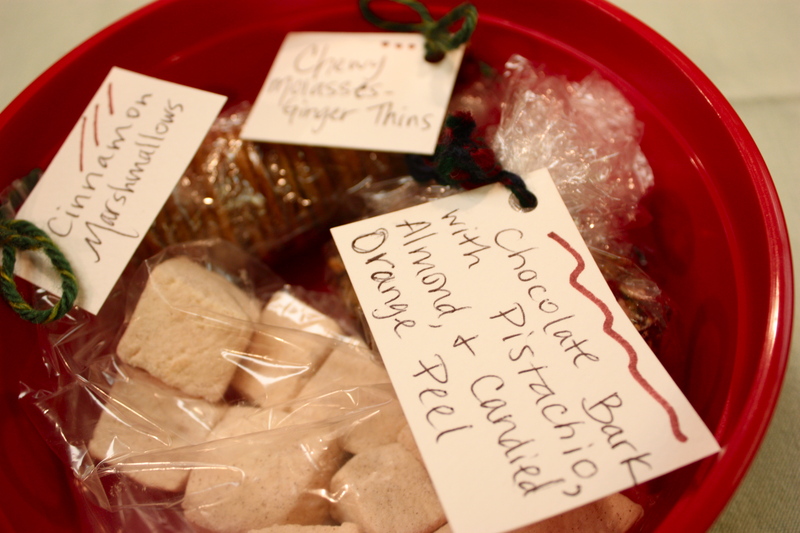 I hope the recipients think so…And this is my first Christmas of such purposeful treat-making! 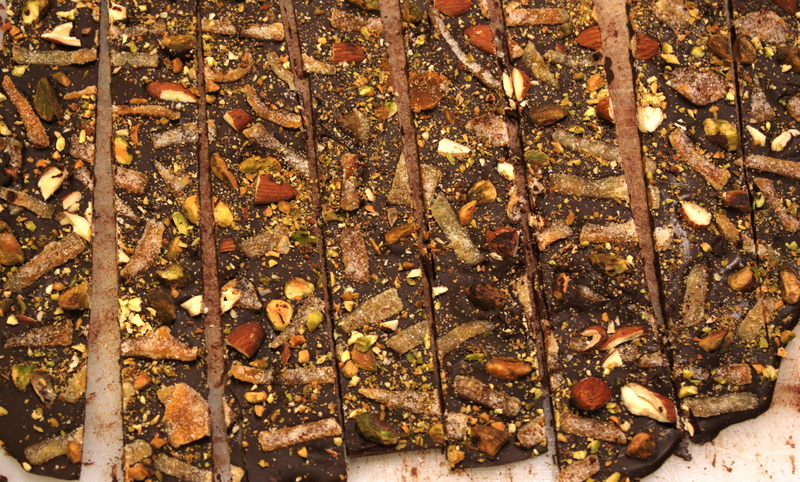 This chocolate bark is too wonderful! I’m sure the milk chocolate would be good, too, but I love the dark chocolate. And the extra time and effort that went into the home made candied orange peel makes it even more special! Thank you! You’re quite welcome! Glad you enjoyed it!